Nowadays, sleek straight hair is totally in fashion. From getting permanent straight locks by undergoing a super expensive chemical straightening treatment at a reputed salon to investing in the top quality hair straightening iron for making the hair look straighter whenever needed, today’s women have no dearth of choices to go sleek and stylish. But have you ever tried all-natural homemade hair packs to turn your dry and frizzy hair silky straight? If not, this is the time to give it a try. Homemade hair straightening packs may not give you great results instantly, but you are bound to be impressed after a few weeks of usage! So, here are why homemade hair straightening packs are a better choice for you and 4 simple DIY recipes to try out. Why Use Homemade Hair Straightening Packs? Well, it’s a no-brainer that homemade packs are made with all natural ingredients. Therefore, we neither need to treat our hair with harsh chemicals nor need to expose it to damaging heat for making it straight. The ingredients used in most homemade packs are readily available to us and can be processed into an amazing straightening remedy the cheapest way possible. It means, there is no need to spend a hole in your pocket by visiting a salon. The hair-friendly ingredients used in these homemade packs can take care of your hair from all aspects. Though they are meant for making the straighter, you will wonder how softer, smoother, silkier, and healthier it will look! Mix all the ingredients well to form a smooth paste of medium consistency. Make sure that there is no lump of banana. Now, apply the pack all over your scalp as well as the length of your hair with the help of a hair coloring brush. Use a wide-tooth comb to comb the pack through the hair nicely, tie all your locks up into a bun, and seal it with a shower cap to prevent spillage. Wash it off with lukewarm water and a mild shampoo after an hour. Both banana and yogurt will deeply nourish as well as moisturize the hair while olive oil and vitamin E condition it intensively in order to keep the frizz under control. As a cumulative effect, the hair fibers will stand comparatively straighter naturally. The ingredients need to be mixed well, ensuring that there is no lump at all. It will form a frothy mixture of medium consistency. Apply it all over your scalp and comb it through your hair. Next, tie your hair up and cover it with a shower cap. Leave it for an hour and rinse off later with a mild shampoo. The egg white in this pack makes the hair stronger and silkier by fortifying each strand efficiently. Banana nourishes and deep conditions to make it softer and smoother. Finally, olive oil and honey keep it moisturized so that it remains straight and can be tamed easily. 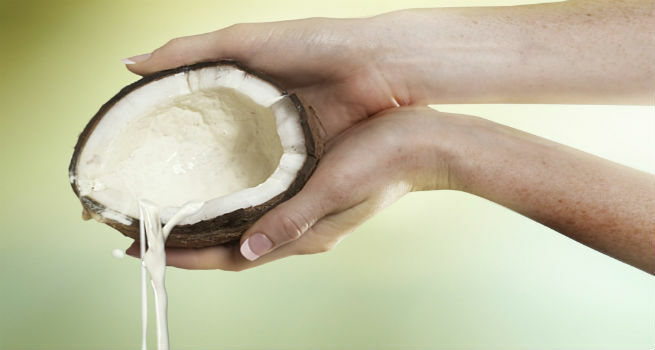 Simply get a cup of freshly extracted coconut milk and apply it to your scalp a little at a time. Massage gently with your fingertips by following a small circular motion while working it slowly into the root of your hair as well as along its length. Cover your hair with a shower cap and let the hair strands dry. Then, rinse with lukewarm water and a mild shampoo. The nutrients in coconut milk are not only great for the health of the hair but also fabulous for its texture. Regular application of this simple pack will nourish, moisturize, and condition your hair fibers profoundly, thereby turning them softer, smoother, and straighter. Apart from making the hair manageable, coconut milk improves its overall health and promotes its growth significantly. Mash both of the ingredients together to form a smooth, uniform paste of thick consistency. Just apply this pack all over your scalp and hair thoroughly and leave it on for an hour. If you wish, you can massage the pack gently into your scalp for 3-4 minutes. Finally, rinse off with a mild shampoo and lukewarm water. Both avocado and banana are rich in healthy fats, which help nourish the hair strands and make them healthier. Moreover, the pack helps in conditioning the hair deeply, which make it smoother, sleeker, and more manageable. Try to find a gentle shampoo that is specifically made for straight hair. It will enhance the impact of your hair pack. Pick an ultra-absorbent towel that will absorb the maximum moisture from your locks as fast as possible. Once you are done with towel-drying, keep brushing your hair every now and then with a wide-tooth comb until it becomes completely dry. If you need to blow-dry your hair, turn on the cold air setting on your hair dryer and go heat-free for a sleek mane. Both hair straightening irons and chemical hair straightening treatments alter the texture and appearance of our hair strands by breaking down the protein bonds present in them. This can eventually be damaging to our hair as it takes a toll on its natural structure.